There are many stainless steel cleaners and polishes that leave a thick oily film on the surface if your appliances. Well not ours! We guarantee that our cleaner will clean without leaving any kind of oily film or streaking. Our InstaNew stainless steel cleaner and polish has been specifically designed to provide the best clean and brilliant shine for all of your stainless steel appliances. All you have to do is spray our cleaner onto the InstaNew microfiber cloth or towel. Then wipe stainless steel surface in the direction of the grain to remove smudges, streaks, film, fingerprints, etc. Enjoy your radiant stainless appliances! It is also packaged in a convenient trigger spray bottle that allows our formula to cling to vertical surfaces and applies evenly for a uniform shine with minimal wiping and buffing. Our stainless steel cleaner removes streaks, smudges, and fingerprints from all of your stainless steel surfaces including refrigerators, sinks, stoves, dishwashers, range hoods, grills, trash cans and other kitchen appliances. We promise you’ll love your InstaNew stainless steel cleaner. If you don’t like it, return it for a full refund within 30 days of purchase. Grab one for yourself and for your very best friend! Just hit the Add to Cart button now! Our InstaNew Jetted Tub Cleaner has been intentionally engineered to be the BEST at removing build up from jetted tub systems. Jetted tub systems can get very disgusting over time! Use it once and it’s evident how well it works! Once the tub is full of water and the cleaner added, all it takes is 15 minutes to get your jetted tub clean and healthy! Also, our low foaming solution will not overflow with suds and will not harm your pipes or septic system. Several months were spent perfecting every detail of this formula, down to the scent, so you can be confident that this is a formula that works great and smells pleasant. Fill the tub with hot water (minimum 100°F) covering the jets by about 2-3 inches of water. Note: Our formula includes a low foaming ingredient that is activated at 100°F. Use water that is warm/hot to touch but not scolding in order to prevent excessive foaming. 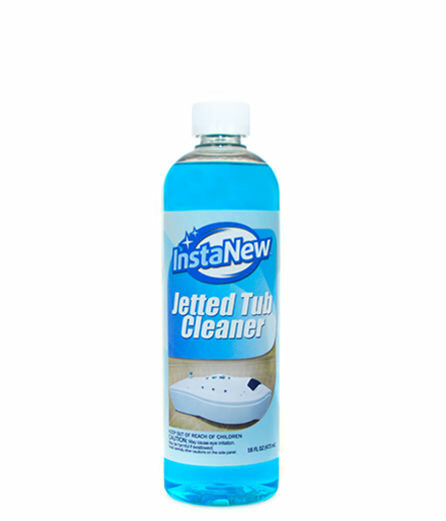 Add 4 oz of InstaNew Jetted Tub Cleaner. Wipe out debris with a towel and all-purpose cleaner. Our InstaNew Premium Shoe Cleaner Kit is safe and great for all shoe types. You can be confident that whether you are cleaning cloth, nubuck, suede, leather, vinyl, or sole; you will have amazingly clean shoes with no stains and with no harm to them at all! Our cleaner not only comes with a free premium synthetic brush, but also a microfiber cloth. No more using old tooth brushes and dirty rags. Our brush and cloth are designed for optimum shoe cleaning. Do you also need to clean your car interior? Our shoe cleaner works great on all fabrics. So you can clean your car interior, furniture, or any other household fabric with tough stains that needs a good cleaning. You can use it as an odor eliminator too! A little goes a long way with our shoe cleaner. All you need is a small amount of shoe cleaner for every shoe cleaned. This leaves you with the ability to clean up to 100 pairs of shoes with just one bottle! We promise you’ll love your InstaNew shoe cleaner. If you don’t like it, return it for a full refund within 30 days of purchase. Grab one for yourself and for your very best friend! Just hit the Amazon button now! Whether your fireplace is made of brick or stone, spray our fireplace cleaner on your fireplace or hearth and instantly see it work. Our cleaner cleans creosote, soot, grease and more! Please note: This is a HEAVY DUTY cleaner. Use adequate ventilation when using this product. Also, read all instructions and safety precautions before using. Paired with a handy brush, our fireplace cleaner bundle is designed to work so effectively that you don’t have to use much effort to get your fireplace clean. So it can tackle any creosote, soot, ash, smoke residue, or carbon deposits! Our cleaner works so well that you can use less than other cleaners to get the same results! So one bottle of InstaNew fireplace cleaner can have your fireplace looking like new for longer while you save money doing it! We specifically picked the brush to give to you that has a great grip and tough polypropylene bristles so it fits nicely in your hand and is easy to use to make it the perfect partner with our fireplace cleaner. Cleans easy to use again and again. We promise you’ll love your InstaNew Fireplace Cleaner. If you don’t like it, return it for a full refund within 30 days of purchase. Grab one for yourself and for your very best friend! Just hit the Add to Cart button now! Our InstaNew Fireplace Cleaner works great to clean any fireplace glass surface. Whether it is a stove cooktop, fireplace glass doors, or any ceramic glass surface; you can clean with confidence that you will have clean and scratch free glass. Use on cold glass only. Our fireplace cleaner works great to remove any unwanted soot, smoke residue, creosote, ash, or carbon dioxide deposits on your glass. Well, our fireplace glass cleaner works great to remove any of those, leaving your fireplace glass looking clear and smudge free. Our fireplace glass cleaner intentionally comes with a free sponge to ensure that you have everything you need to clean your fireplace glass. Our cleaner works so well that you can use less than other cleaners to get the same results! So, one bottle of InstaNew Fireplace Glass Cleaner can have your fireplace looking like new for longer while you save money doing it! We promise you’ll love your InstaNew Fireplace Glass Cleaner. If you don’t like it, return it for a full refund within 30 days of purchase. Grab one for yourself and for your very best friend! Just hit the Add to Cart button now!